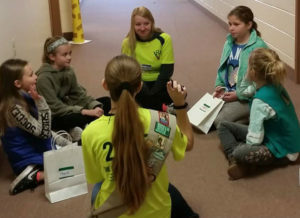 Team 2607 held its second GIRLS IN STEM DAY on Saturday November 10, 2018. 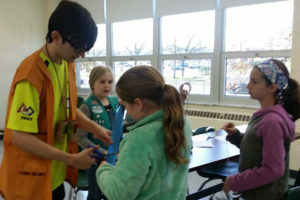 Various Junior and Cadet girl scouts from different troops participated in a day full of STEM related activities. This year’s theme was “Welcome to the Jungle”. The team had four different centers/stations which rotated different groups of girls throughout the day. Each station/center was represented by a letter from STEM and honored a woman who worked in a STEM related field. 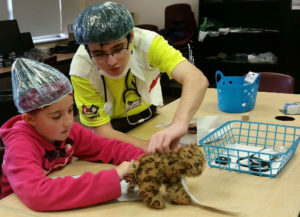 The girls learned about the care of animals with specific illnesses or injuries. T: Technology: Roger Airline’s Young. 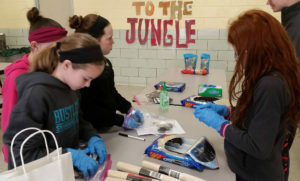 Here the girls built animal enclosures and a pair of binoculars. of Oreo cookies and animal crackers.